This is a funny, easy and healthy Easter recipe that kids and adults will love. It’s a 3 – ingredient recipe suitable for many diets: vegan, gluten-free and dairy-free plus, it’s definitely healthy! In Italy, the Easter tradition is to exchange big chocolate eggs with surprises hidden inside so that kids and adults would end up eating a huge amount of chocolate for a few days. Chocolate and sweets are the big Easter attraction in many countries around the world, but with just a little imagination we can still enjoy the festivities, make kids happy, have fun AND also keep our healthy eating habits. What do you need to make this healthy Easter recipe? In this version of a healthy bunny, you just need one apple, one strawberry and two hazelnuts. You can use a dark background, such as a baking tray, a white one or any monochromatic plate. If you choose a white background, it’d probably be better to use hazelnuts with skin to have more contrast. To make this Easter bunny, you just need to cut the fruits in the right way so that you can make the ears, mouth, nose and whiskers. Follow the instructions on the recipe card below to know exactly how to cut them. Make sure that the fruits are not too ripe, otherwise it will be hard to cut them into the needed shapes. You want the strawberry to be long and pointy for a nice nose. Finally, to avoid the oxidizing of the apple and turning black too quickly, use some lemon water that you can make by mixing a cup of water and a teaspoon of lemon juice in a small bowl. When you cut your pieces of apple, just immerse them in this mix for a few seconds. I hope you enjoyed this funny bunny. If you think that playing with real food is funny to teach kids how to eat healthy, have a look at my Christmas tree recipe. As always, I appreciate your stopping by my blog. 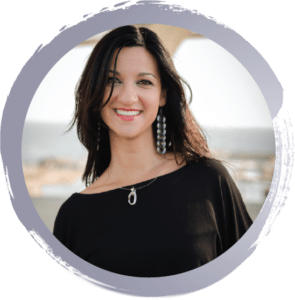 If you think this post might help someone you know to make another step to a healthier lifestyle, please don’t hesitate to share it! This is a funny, easy and healthy Easter recipe that kids and adults will love. It’s a 3-ingredient recipe suitable for many diets: vegan, gluten-free and dairy-free plus, it’s definitely healthy! Use one half to make the ears by cutting two slices from each side and placing them facing one another. Note, don’t make those slices too thick. You shouldn’t be using the entire half of the apple. Cut small pieces of strawberries and place them between the two slices of apple. Cut one thin slice for the mouth and cut most of the flesh, so that you end up with a thin slice. Do the same for the line connecting the nose and mouth. For the nose, cut the end of a pointy strawberry and cut it in half. 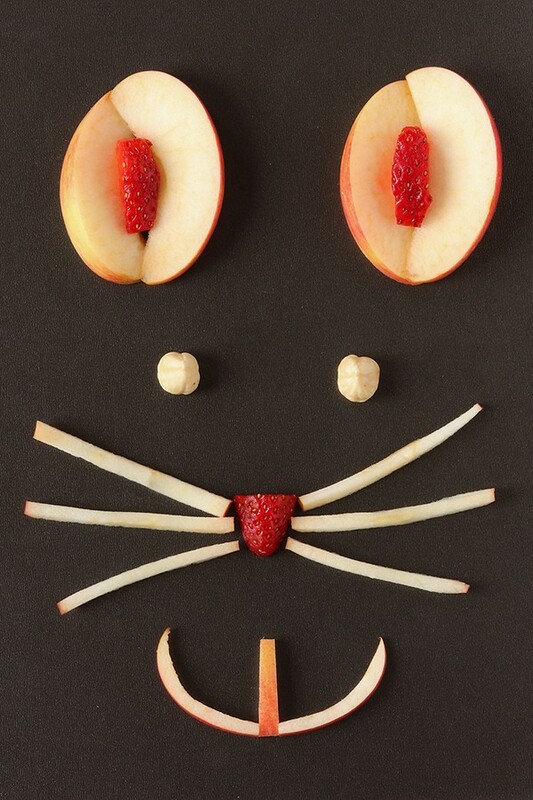 Cut an entire slice of half an apple to make the whiskers. Make sure to make the whiskers thin and place them really close to the nose. Use the hazelnuts for the eyes. Hi Claudia, Your healthy Easter bunny is super cute. It would make a nice simple centerpiece for an Easter brunch or lunch. The food can be a decoration too right? I remember those giant amazing chocolate eggs in Italy you speak of. I’ve seen them and they are always decorated so beautifully. How adorable!! I love how festive this is- I”m always looking for fun stuff for my twins in coming years. Love the amount of creativity here! This is perfect for Easter or, in fact, any other day I may need a happy bunny face on the table! And the fact that there are only 3 ingredients is just perfect! This Easter bunny is such a cute idea! So many youngsters devour tons of chocolate at Easter it’s great to have a healthy treat too! What a fun presentation, that video is great too, love it!